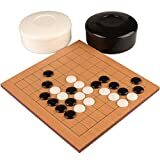 Go is usually played on a board with a 19x19 grid. There can be marked points on the boards that serve as reference points (and also to place the the handicap stones). The stones are black and white lens-shaped disks. Black starts the game and has 181 stones while white have 180. 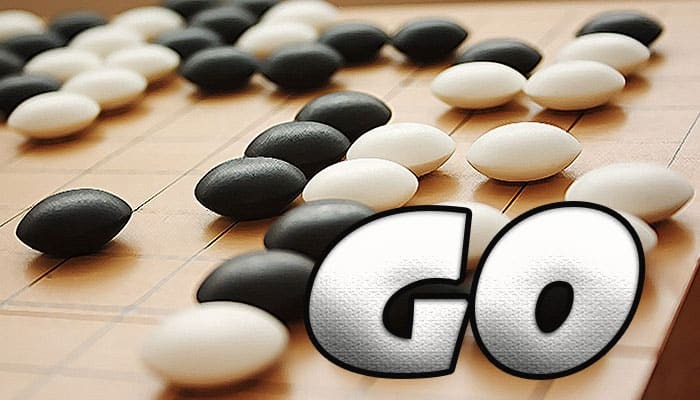 We recommend that beginners learn the basics on a 9 by 9 board, moving up to a 13 by 13 board after a few games and only playing on a 19 by 19 board when they feel really comfortable with the strategic concepts and finish their games in less than 15 minutes. The player with the black stones makes the first move. Thereafter, the players of white and black alternate making their moves. 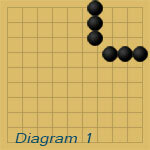 A move is made by placing a stone on an unoccupied interesection. 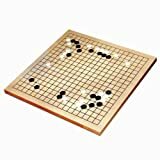 A stone does not move after being played, unless it is captured as prisioner and taken off the board. At any time, a player may pass (not make any move) because placing a stone in a surrounded territory will cost him a point. When both players have passed, the game is finished and the score is counted. The player who controls the most territory (points) at the end of the game wins the game. Points are gained by surrounding territory. Territory is empty spaces that are bordered and surrouned completely by stones of the same color. The edge of the board acts as a natural boarder. 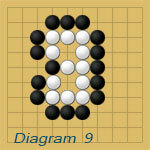 In diagram 1, the stones make 9 points of territory. The edges at the board act as borders and because they are empty, they count as points. In diagram 2, the stones make 4 points of territory. Here are two examples of finished games. The game is finished when all the empty points are surrounded by one player or the other. In diagram 4, white has 34 points and black 31 points. Note that placing a stone inside a territory you have already surrounded will reduce your score by one point. Stones of the same color on adjacent intersections are connected and form a group. The connection can be horizontol or vertical, but not diagonal because the connection goes along the lines. The empty spaces next to a stone are called liberties. A single stone has four liberties. When two or more stones are connected, the group share their liberties. When a player places a stone, this (or the group that its connected with) must always have one liberty left. Players can capture an opponent's stone (or group of stones) by placing a stone on all liberties of the stone (group). 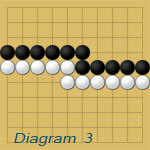 Then the captured stone or group is removed from the board and kept by the player who captured it. At the end of the game, the captured stones are placed in the opponent's territory to reduce the scores. This means that a captured stone can be seen as two points (1 for the empty place and 1 for the reduction of points on the end. 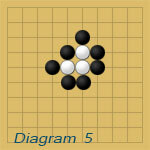 In diagram 5, black can remove all three white stones because the white stones don't have any liberties (escapes). They are surrounded completely. In diagram 6, there is still one liberty left and black must fill it first. When a group has only one liberty left, we say that this group is in atari which means that the next turn it can be captured. When you place a stone, you count first its caputures before it liberties. A single empty space inside a group of stones is called an eye. To capture a group, all liberties (touching intersections) must be filled with stones. But the group must not only be surrounded on the outside, but also the empty adjacent spaces inside the group must be filled as well because they are also liberties. 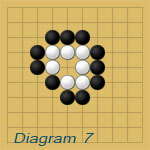 In diagram 7, the single empty space inside the white group forms an eye. In order that a group can remain alive, it must contain at least two separate spaces (eyes). 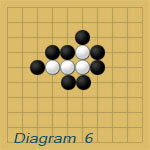 In diagram 8, black can place a stone on the empty place and now all white stones are captured. 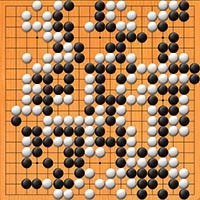 Note: When white had one liberty left from the outside that this move could not be played because placing a stone where it is captured is illegal (suicide). Groups with two eyes can not be captured because those eyes can not be filled. If we would place a stone in one eye, then the group would still remain because it has still one liberty (the second eye). We can not place this stone, because it would be suicide. In Go, it is a key element to create enough eye spaces for your groups and to prevent your opponent from making eyes. 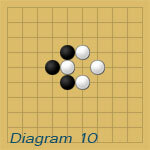 In diagram 10, black can put a stone in the eye of white. This will capture the white stone and he will now be removed (diagram 12). 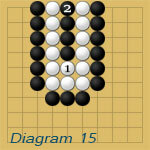 Now, white can put a stone in the eye of the black group (diagram 13) and this will capture the black stone. 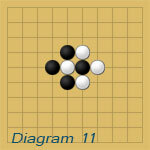 When we remove the black stone we have diagram 10 again. This can be repeated endless and this situation is called "ko". To prevent such situations there is another rule: if black captures as in diagram 11, then white can not recapture immediately but must wait at least one move. If white plays, then black can capture the white group completely. So, white must not play or even pass. If black plays one stone, than white can capture the black group and remove it. 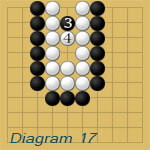 Now black tries to prevent white to make two eyes and put one stone (diagram 17), but white can place stone 4 making it impossible that black can capture the white group. Consider diagram 14 again. If white plays, the whole group is captured. 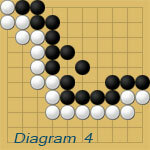 If black plays, white will capture 4 black stone and get 4 points. So, each player that plays will loose playing in that area, therefor no player should make a move there. Such a situation is called a "seki". 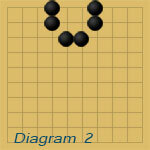 At the end of the game, neither player gets any points because the empty spaces are not surrounded by either side.